This study aimed to determine the seasonal changes of total antioxidant activity and phenolic compounds in samples taken from leaves (April, July, October) and stems (April, July, October, January) of some almond (Prunus amygdalus L.) varieties (Nonpareil, Ferragnes and Texas). It was indicated that antioxidant activity and phenolic compounds in leaves and stems of Nonpareil, Ferragnes and Texas showed seasonal differences. Antioxidant activity IC50 of these varieties reached the highest value in April for leaves whereas in October for stems. The highest level of total phenolic compounds was in January for stems while in October for leaves. These results showed that total antioxidant activity and phenolics in leaves and stems of almond varieties changed according to season and plant organ. Climate is a factor which affects agricultural production. Increase of temperature or variations in precipitation ratio affect physiological events in plants [1–3]. Almond belongs to Rosaceae family and is an important product due to high commercial value of its fruits. Its fruits are nutritious due to their protein, fat, mineral substance, fibre and vitamin E content [4–10]. Natural products derived from plants are used for health supplements . Antioxidants are compounds which prevent or delay the oxidation of lipids or other molecules by inhibiting the initiation or propagation of oxidative chain reactions have positive effects on human health [12, 13]. Phenolic substances are one of the most widely known substances with their antioxidant characteristics [14, 15]. Phenolic substances are metabolites with different structure and functions, having an aromatic ring containing generally one or more hydroxyl group [16, 17]. Antioxidant effects of phenolic compounds are explained by bonding free radicals, forming chelate with metals and inactivating some enzymes . Various studies carried out on almond cultivars showed that almond fruit and sections have phenolic compounds and antioxidant activity [19–23]. It was found that total antioxidant activity varied according to season, plant organs and varieties (Figures 1 and 2). 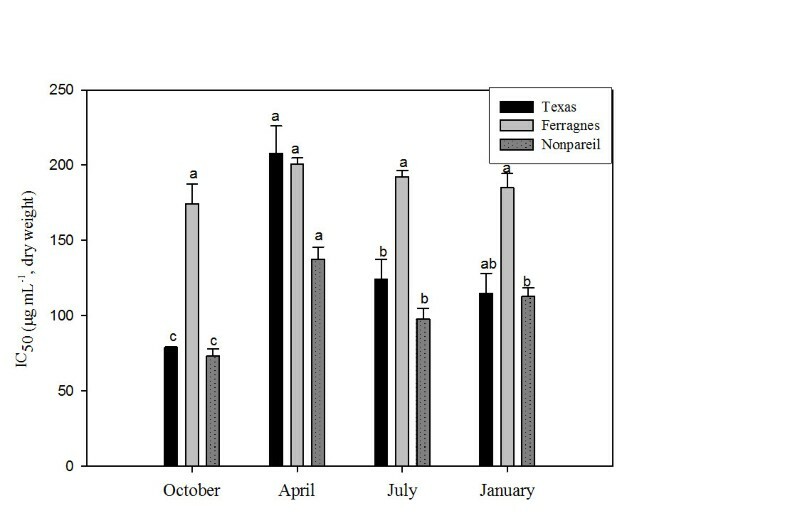 Total antioxidant capacity in the leaves of almond varieties (IC50) was low in April in Texas, Ferragnes and Nonpareil (high antioxidant activity) (Texas, 88.67 μg mL-1; Ferragnes, 121 μg mL-1; Nonpareil, 64 μg mL-1) (p < 0.05). The highest IC50 value (low antioxidant activity) was found in July for Texas, Ferragnes and in October for Nonpareil (Figure 1). It was determined that antioxidant capacity was the lowest for Nonpareil (high antioxidant activity) and high (low antioxidant activity) for Ferragnes in April (Figure 1) (p < 0.05). Seasonal total IC 50 changes in leaves of Nonpareil, Texas and Ferragnes in DPPH. (Data followed by different letters are significantly different from each other (p < 0.05) according to Duncan’s test). Seasonal total IC 50 changes in stems of Nonpareil, Texas and Ferragnes in DPPH. (Data followed by different letters are significantly different from each other (p < 0.05) according to Duncan’s test). IC50 values in the stems of almond varieties were low in October (high antioxidant activity) (Texas, 79.16 μg mL-1; Ferragnes, 174.46 μg mL-1; Nonpareil, 73.50 μg mL-1); and high in April (low antioxidant activity) (Texas, 207.79 μg mL-1; Ferragnes, 200.67 μg mL-1; Nonpareil, 137.67 μg mL-1) (Figure 2). The variation in antioxidant activity was significant in other varieties excluding Ferragnes (p < 0.05). IC50 values of Ferragnes and Texas varieties were similar in July and January. On the other hand, it was found that IC50 values were at the lowest level in Nonpareil and Texas (high antioxidant activity) and high in Ferragnes (low antioxidant activity) in October (Figure 2). 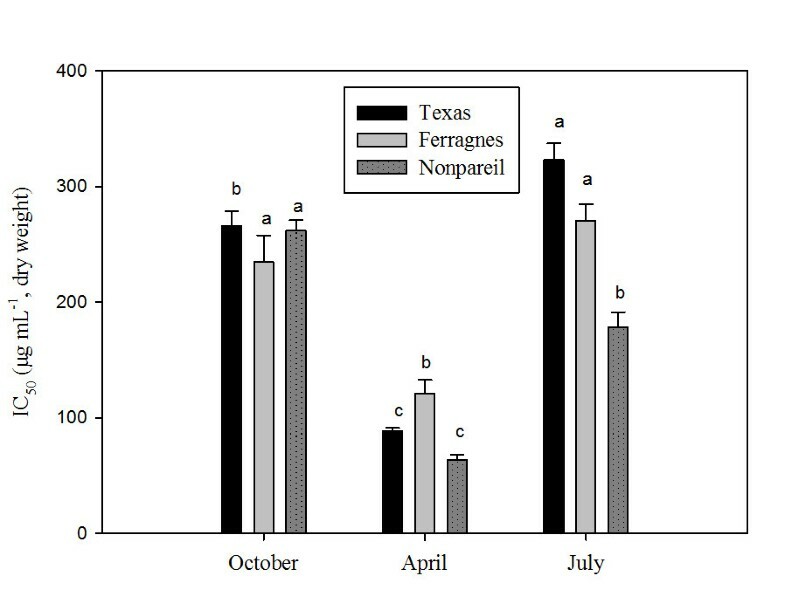 Phenolic compounds in the leaves of Nonpareil, Texas and Ferragnes varieties were high in October (Figure 3) (p < 0.05). In this month, values of phenolic compounds of Texas, Ferragnes and Nonpareil were 2.03 μg mg-1, 2.82 μg mg-1 and 8.15 μg mg-1 respectively. In all varieties, phenolic compounds were low in April and July and the variations observing in April and July were not significant statistically (Figure 3) (p > 0.05). 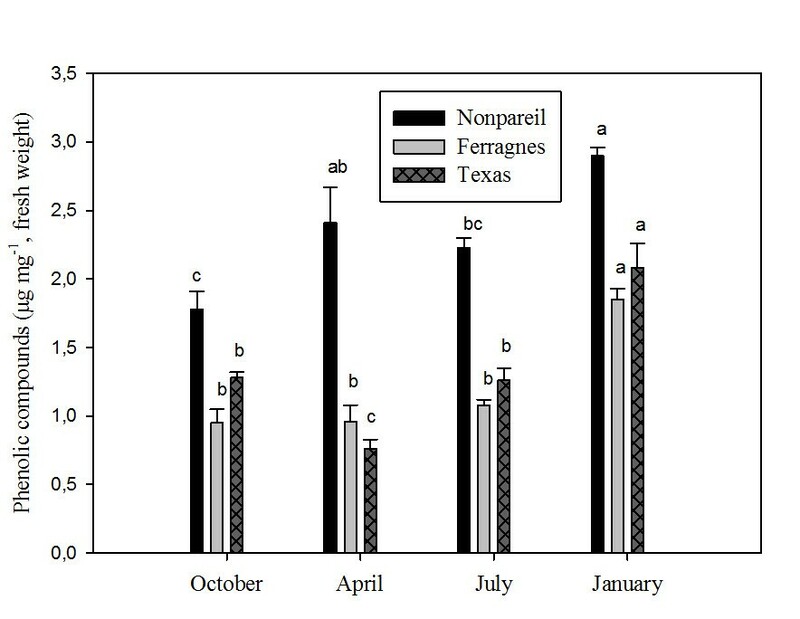 Seasonal total phenolic compounds in leaves of Nonpareil, Texas and Ferragnes. (Data followed by different letters are significantly different from each other (p < 0.05) according to Duncan’s test). It was found that phenolic compounds in the stems of almond varieties also varied according to months. In all varieties, phenolic compounds were the highest in January (Teksas, 2.08 μg mg-1; Ferragnes, 1.85 μg mg-1; Nonpareil, 2.90 μg mg-1) (Figure 4) (p < 0.05). The lowest phenolic compound contents were in October (0.95 μg mg-1) and July (1.08 μg mg-1) for Ferragnes and; in April for Texas (0.77 μg mg-1). In Nonpareil, levels of phenolic compounds were higher than other two varieties in all months (Figure 4). Seasonal total phenolic compounds in stems of Nonpareil, Texas and Ferragnes. (Data followed by different letters are significantly different from each other (p < 0.05) according to Duncan’s test). In another study, carried out on different cultivars of California almonds, it was determined that flavonoid content and antioxidant activity depended on the cultivar rather than season . As indicated above, this study found that antioxidant activity showed seasonal variations in stem and leaves of almond varieties (Nonpareil, Texas and Ferragnes) (Figures 1 and 2). Esfahlan and Jamei  carried out a study in fruits of ten wild almond species and reported that there were variations in flavonoid, phenolic contents and antioxidant activities according to almond species. The present study found that antioxidant activity varied according to varieties and plant organs. 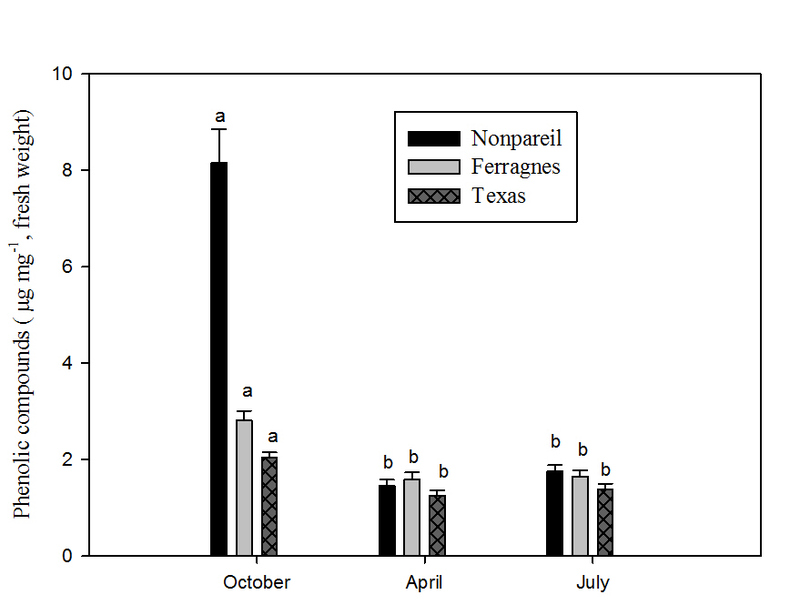 In April, antioxidant activity was the highest in the leaves of Nonpareil variety and the lowest in Ferragnes (Figure 1). On the other hand, in stems, it was high in Nonpareil and Texas and low in Ferragnes in October (Figure 2). Cosmulescu and Trandafır  investigated the seasonal variation of total phenols in the leaves of Juglans regia L. They found that total phenols increased in June and July; decreased in August and increased in early September. They reported that there could be a correlation between phenolic content, season, genetic and ecological factors in walnut leaves. Sivaci and Sökmen  carried out a study on stem cuttings of Morus alba and Morus nigra and found that antioxidant activity and phenolic compounds showed seasonal variation. The highest antioxidant activity in stems was found in October. It was found that total antioxidant activity and phenolic compounds in Nonpareil, Texas and Ferragnes varieties exhibited variations according to season, plant organ (leaf and stem) and variety. This could be result from ecological, genetic and metabolic differences as indicated other studies [27, 29]. Also, in the period during almond tree has no fruit, the leaves and stems could be made use of due to their antioxidant activity. The leaf and stem samples were homogenized in 2.5 ml ethanol and shaken in water bath at 25°C for 24 h. Homogenized samples were filtered. 1 ml ethanol, 5 ml distilled water and 1 ml Folin-Ciocalteu reagent were added to 1 ml of the filtered samples and shaken well. After 3 minutes, 3 ml of Na2CO3 (2%, w/v) was added and shaken in a dark medium at intervals for 2 hours. Absorbance values were read at 760 nm for phenolic compound amounts and amounts were determined according to standard gallic acid equivalence [31, 32]. The assay was carried out in triplicate. This study was supported by Adıyaman University Scientific Research Projects Unit (SRP). I would like to thank Hüseyin Bereket from Lokman village, who is the grower of the almond varieties using in this study, and Dr. Rıza Binzet who helped field studies.